The item Willow finds a way, (electronic resource) represents a specific, individual, material embodiment of a distinct intellectual or artistic creation found in Austin Public Library. 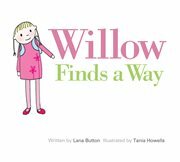 Willow's bossy classmate Kristabelle is having a birthday party and she has invited the whole class, but in order to say on her birthday party list, her classmates must do everything she demands. Willow has often wished she could say "no" to Kristabelle, and when people start getting uninvited from the party, she finally finds the courage, in her own quiet way, to do so.